Rating: 5.0/10. From 46 votes. 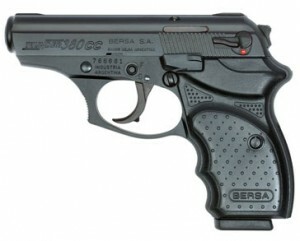 Summary: The description, specs, photo, pricing and user ratings for the Bersa Thunder 380 Concealed Carry. The Thunder 380 Concealed Carry from the left. .380 ACP 8+1 3.25″ 6″ 4.75″ 1″ 23 oz. This entry was posted in .380 ACP, $251-$500, Bersa, Compact, Eagle Imports, Semiauto, Subcompact on May 27, 2010 by Staff. My first small pistol. A little large for pocket, but ok for cc. Shot well, ate any .380 ACP I fed it. Medium trigger, easy to work slide and external safety. Liked the key locking feature. Scalloped grip felt good, but I got a Pachmayr grip sleeve that was nicer. Sights all but useless. Extended mag (2 extra rds) was also a good add-on. But note: regular Thunder mags DON’T fit this gun and vice versa. Extra mags very hard to find. But it was accurate, felt good, moderate flip/recoil. Sold it only because I liked the (then) new Glock 42 better. New owner likes it.